HANOVER, MA. — Join Boston All-Star designated hitter David Ortiz for baseball instruction and fun at the 2014 Market Basket David Ortiz Baseball Clinic in partnership with Citi presented by P&G. Date: November, 2. Location: University Sports Complex in Hanover. Time: 9:00 AM to 12:00 PM for boys and girls grades 1 – 12. Cost: $149. Source: Procamps.com. 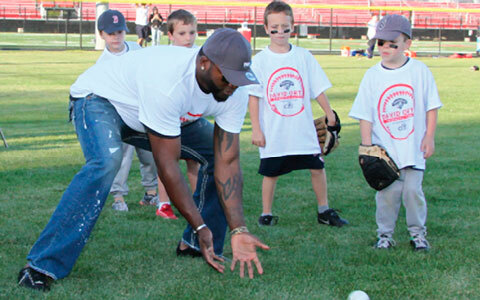 Photo shows David Ortiz giving baseball instruction at Baseball ProCamp. Attendees will participate in games, stations, and skill contests during the clinic. Each child will be placed on a team according to his or her age. David will also give talks highlighting the finer points of the game of baseball and beyond. Parents and guests will be able to listen to clinic guests in designated areas at each location. David Ortiz, nicknamed “Big Papi,” plays for the Boston Red Sox. He is mostly a designated hitter, but sometimes plays first base. Ortiz played with the Minnesota Twins from 1997 to 2002. He is an eight-time All-Star and holds the Red Sox single season record for home runs in a regular season with 54, set during the 2006 season. In 2005, the Red Sox presented him with a plaque proclaiming Ortiz “the greatest clutch-hitter in the history of the Boston Red Sox”. He is one of 50 MLB players in history to hit at least 400 career home runs. Playing Field Promotions is a booking agent for motivational sports speakers and celebrities. If you would like to book David Ortiz for a speaking engagement or personal appearance, contact David Ortiz’s booking agent for appearance & speaker fees at 1.800.966.1380.